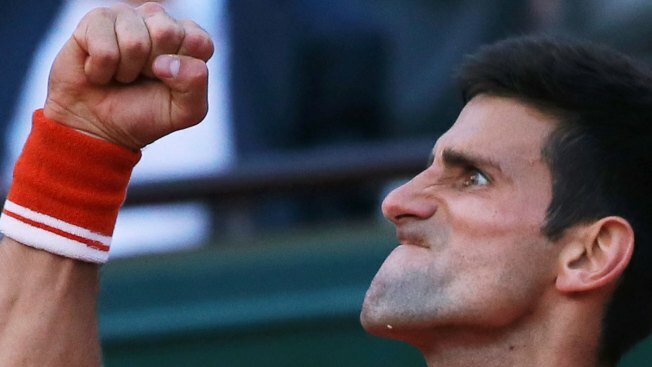 Serbia's Novak Djokovic clenches his fist after scoring a point in the semifinal match of the French Open tennis tournament against Britain's Andy Murray at the Roland Garros stadium, in Paris, France, Friday, June 5, 2015. Novak Djokovic has waited and waited to win his first French Open title and complete a career Grand Slam, worrying about when — or perhaps even whether — he would get another chance after coming close in recent years. The eighth-seeded Wawrinka, who eliminated Roger Federer in the quarterfinals, followed that up by defeating France's Jo-Wilfried Tsonga 6-3, 6-7 (1), 7-6 (3), 6-4 in Friday's opening semifinal. Wawrinka succeeded largely on the strength of one statistic: He saved 16 of 17 break points. The first chants of "Son-gah! Son-gah!" accompanied by rhythmic clapping arrived before the first point was played, and they returned over and over at key junctures, as did yells of "Allez, Jo!" and other support for Tsonga that prompted the chair umpire to ask for quiet. The temperature topped 90 degrees (32 Celsius) at Court Philippe Chatrier, and the players wrapped towels filled with ice around their necks at changeovers to try to cool off. "Heat didn't bother me," Tsonga said. "My opponent made my life difficult." 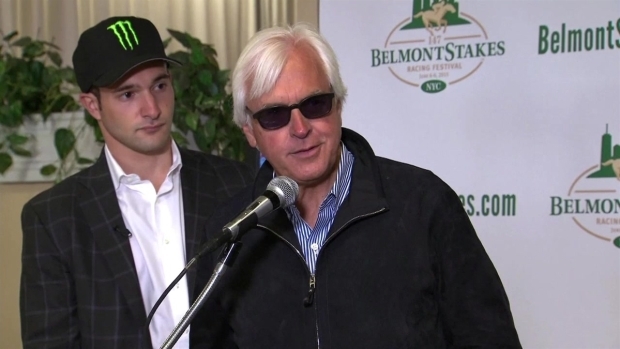 American Pharaoh will be the 14th horse in almost 40 years with a chance to win horse racing's Triple Crown. A year ago, after winning the Australian Open championship, Wawrinka lost in the first round in Paris. Now he's into his first French Open final and second at a major. For Djokovic, so much is at stake this weekend. It would be Djokovic's third appearance in the final in Paris. He lost in 2012 and 2014 to Rafael Nadal, the nine-time champion whose 39-match Roland Garros winning streak was ended by Djokovic in this year's quarterfinals. Entering Friday, Djokovic was 40-2 this season, with 27 victories in a row. He looked like that same, dominant player for the first two sets against Murray, a two-time major champion trying to become the first British man to reach the final in Paris since 1937. But the Serb's form began to dip in the third set, while Murray started to play better and better and tried to rile the crowd by motioning for more support. Murray broke Djokovic for the first time to go ahead 6-5 in the third, then served that set out at love — the first set Djokovic dropped over these two weeks. After that, Djokovic went off the court to visit with a trainer, perhaps for treatment on the groin muscle problem he dealt with earlier in the tournament. Starting in the second set, and continuing into the third, Djokovic did deep knee bends and flexed his hips and upper legs. The match was becoming more competitive, and the second game of the fourth set was tremendous. Djokovic held three break points, but failed to convert any. On one, a 34-stroke exchange that was the day's longest, he put a forehand into the net. A too-long forehand ended a 28-stroke exchange on the game's last point. That was part of a run of nine consecutive points for Murray, who broke Djokovic at love to lead 2-1. But Djokovic is nothing if not a fighter, and when Murray dumped a forehand into the net, another break made it 2-all. Djokovic pumped his right fist and looked up at his guest box, where his wife stood, clapping and yelling. They'll all be back Saturday for more.